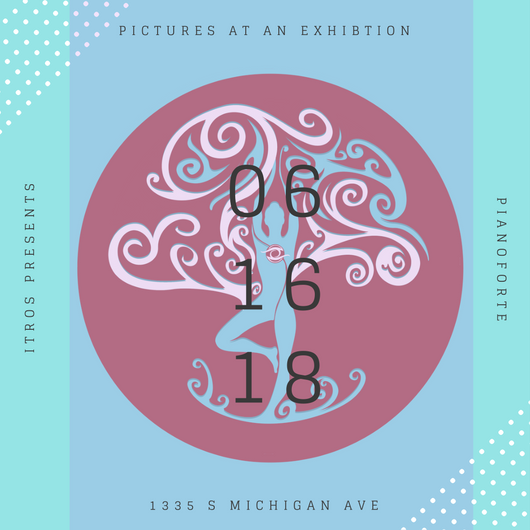 Get tickets to ITROS Presents: "Pictures At An Exhibition"
ITROS Presents: "Pictures At An Exhibition"
This is a unique multi-sensory concert and silent auction for In The Realm Of Senses's upcoming multi-modal project set to open fall of 2018 fall. Cocktails by Arun's Thai, beer by Maplewood and Temperance breweries included in ticket price. - Jeff Yang's original arrangement of Mussorgky's "Pictures At An Exhibition" for two players, featuring Jeff on violin, viola, cello, and four baroque recorders, and Yana Reznik on piano. - Live animation of John Gaudette's lithographs of each movement of the work by Galina Shevchenko. - Gastronomic creations based on movements of the music by Arun's Thai, Mango Pickle, Rickshaw Republic, and Chocolat Uzma Sharif. - Silent auction featuring unique works by ITROS artists: rare scent parabole "Volatile Marilyn" by Christophe Laudamiel, a specially design Zoo perfume by Laudamiel customized uniquely to the winner, live aural painting created by Melanie Brown and Ryan Ingebritsen at the event, original lithographs of "Pictures At An Exhibition" by John Gaudette, original art by Pia Cruzalegui, Maya Bosen, Galina Shevchenko, complete recordings of Eighth Blackbird, and many other creations by artists on our roster.